With the exception of a few daffodils, the gardens outside our home sit vacant and we're waiting patiently for warmer weather. Hopefully, sometime around Mother's Day, we'll start planting. 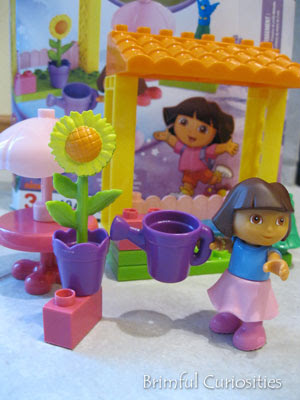 In the meantime, the little green thumbs in our home have kept busy with some pretend gardening with Dora. The set is recommended for ages 3+ and includes several small parts. Building the gazebo as pictured on the box really isn't too difficult. Like all building sets, kids can use their imagination to set up the blocks however they prefer, anyway. The small playset works perfectly fine as a stand-alone set and offers several options for imaginative play. My kids prefer to set the gazebo up separately and move the accessories around while they play. The Build and Dress Dora figure has some special features worth mentioning. It is a positionable doll -- her arms and legs move and her head twists. Even her wrists rotate, allowing her to grasp onto the watering can and dump pretend water onto her flower! The figure pulls apart to make it easy to change out the skirt, from blue to pink or vice versa. 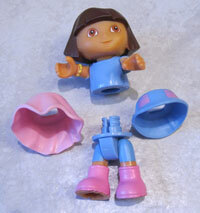 Also, if Dora is in the mood to wear pants, one can just leave the skirt off altogether. While my kids can pull the figure apart themselves, they have some difficulty putting it back together. My daughter especially enjoys playing with the Baby Blue Bird. In fact, at the time I took the photos, the bluebird was off on an exciting adventure somewhere in our home. My son is a little sad that the set only includes one character figure from the TV show. He wanted to know what happened to Boots! I do wish that play sets like this would include more than one main character. Siblings would be able to play with it together and the figures could hold conversations. Also, though it includes a table, this garden set lacks a chair. My kids remedied the situation by using a chair from a Fisher Price toy. An extra flower would be a nice addition as well. The buildable playset works with other Mega Bloks sets (as well as Lego DUPLO bricks) for open-ended play. My kids plan to build a house for Dora so they can attach this set as an outdoor living space. Dora's Garden Gazebo retails for $14.99 and is available at Kmart, Toys R Us, Wal-Mart, select Target stores and Amazon.com. And, for Mega Bloks fans, MEGA Brands has launched a community website called the Mega Bloks Family Club. It's a free site and members receive a coupon for $5 off any $30+ Mega Bloks purchase in addition to other exclusive content. To sign up, visit http://familyclub.megabloks.com. 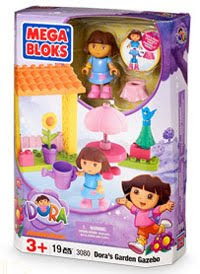 MEGA Brands has kindly offered to giveaway a Mega Bloks Dora's Garden Gazebo playset to one (1) Brimful Curiosities reader. To enter this contest, leave a comment relevant to this post. What other Mega Bloks product would be popular in your home? • Contest ends on Monday, May 16th, 2011 at 11:59 PM CST. My son would enjoy the Fire Patrol Station! My daughter would love the hello kitty big house. We have a larget set of mega blocks. We would love to add Dora to it! My daughter's would love any of the Hello Kitty products!! The Hello Kitty flowershop would be a hit at my house!! My granddaughters would love any of the Dors products but the Hello Kitty Bog House is too cute. My boys would like the Probuilder Assault Chopper. Thanks. I think my granddaughters would enjoy the Hello Kitty flower shop, they've really enjoyed planting flowers this year. I like Hello Kitty Mega Bloks Candy Shop! Thomas the train, for sure! Would love to win the Dora but Thomas would be great in our home for the boys as well!! !